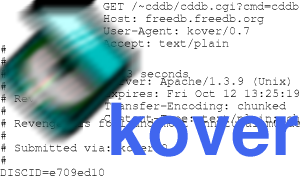 Kover is an easy to use WYSIWYG CD cover printer with CDDB support. Only tested on Linux and FreeBSD. I know it has been a really long time since the last release and although I am releasing a new version there are not many changes from myself. The biggest change is the FreeBSD support by Markus Brueffer. 2002-05-12: 2.8.4 released. Only some bugfixes. 2002-04-22: A Development version (2.8.3) release. 2001-11-19: New version (0.8.3) released. Minor feature enhancements and bugfixes. Last modified: November 21 2008 12:41:40.